Preservation Texas urges the City of El Paso to accept the $56,000 matching grant from the Texas Historical Commission to conduct a survey of its historic downtown commercial architecture. The following editorial appeared in the El Paso Times on June 3, 2015. For a city with as much sunshine as El Paso, its magnificent historic architecture has been kept in the shadows for too long. The planning and development of Downtown El Paso at the turn of the 20th century was guided by some of the finest architects and planners, and the construction of each new building was celebrated for its quality and distinctiveness. A headline in 1910 touted that in designing and building great buildings, “This city does not have to import her skilled specialists.” As many of El Paso’s Downtown landmarks pass the century mark, preservationists are beginning to realize that the city has one of the richest surviving collections of historic architecture in the southwestern United States. This architectural heritage is a tremendous asset that can be the basis of continued economic growth and progress through preservation. In Texas, historic preservation generates $4.6 billion in economic activity each year. El Paso has the architectural asset base to take full advantage of this activity. The examples set by cities such as Charleston, New Orleans and Santa Fe provide evidence that committing to a long-range vision that makes preservation a civic priority can pay globally renowned dividends for decades. 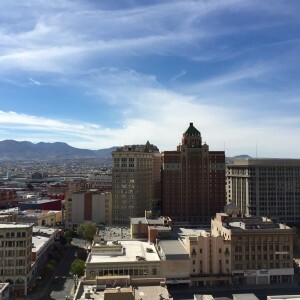 El Paso may be younger, but it is no less historic, and as El Paso’s world-class historic resources age their significance will only increase. The opportunity to accept a $56,000 grant from the Texas Historical Commission to survey Downtown El Paso’s architectural landmarks is an important step on the journey to building a strong preservation-based economy. Through survey and documentation, El Paso can better plan for preservation while accommodating new construction. Further, the establishment of a National Register historic district Downtown will not only reinforce the significance of El Paso’s old landmarks, but it will open the doors for private property owners to earn federal and state historic preservation tax credits. Only buildings that are included in the National Register or designated as Recorded Texas Historic Landmarks can qualify, and establishing a district ensures that the maximum number of buildings will be eligible. Combined, these federal and state credits can total as much as 45 percent of the cost of restoration. National Register districts emphatically do not come with federal regulations, and 21st century architecture can happily coexist with historic architecture in such districts to create and sustain a vibrant and livable downtown. And National Register districts are proven to enhance and maintain property values, which further rewards investment in established neighborhoods that also make efficient use of existing public infrastructure. El Paso’s significant international history, its appealing climate, and the historic commercial and civic architecture designed by some of the best architects in America in the early 20th century positions El Paso to establish itself as a leading preservation destination in Texas, if not the United States, in the century ahead. Preservation Texas is proud of the work of El Paso’s preservationists, and the city of El Paso has been an important partner in saving endangered places such as the Albert Fall Mansion. Its continued leadership in building a broader preservation movement is essential. The completion of a survey of El Paso’s historic Downtown architecture will bring it out of the shadows, and its restoration will put El Pasoans to work bringing new life to some of the most important historic architecture in Texas. Evan R. Thompson is executive director of Preservation Texas.